Early this spring, Disney World launched their newest design in refillable mug fashion. 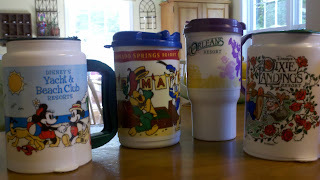 If you are staying in one of the Disney resorts for a good week or so, especially if you are a big soda or coffee drinker, then these mugs are the way to go. For $13.99, you can purchase a mug that you can refill at one of the resort's soda fountains any day, all day, for the length of your stay. 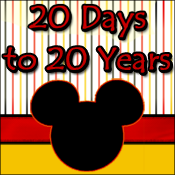 Also, if you have the quick service dining plan or the deluxe dining plan, these mugs are included in those. 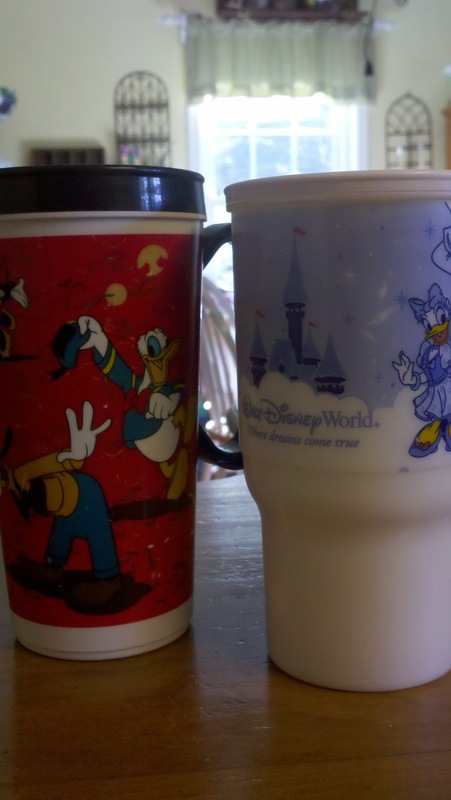 Once upon a time, the refillable mugs were resort specific and became collectors items for avid Disney goers. Each resort had their own design, and some of the earliest mugs (Fort Wilderness Campground specifically) were touted as "refills for life!" Many seasoned campers still use them today. 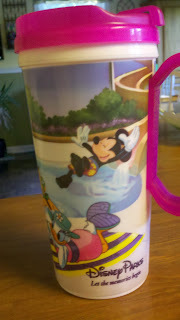 However, to the disappointment of the collectors, Resort themed mugs went out when the "Year of a Million Dreams" came in. Now, all the mugs are the same. The concept behind them hasn't changed, however. 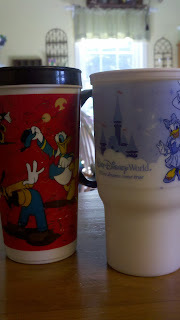 The mugs may be refilled many times over in the resorts, but not in the parks. Although, I do enjoy filling mine up in the morning with coffee, brining it with me into the parks, and using them at the water fountains all day. They clip easily to a backpack with a carbiner. Since the Year of a Million Dreams, the mug designs have changed every other year. Who knows how long this newest design will last? I have heard rumblings of rumors that Disney will eventually do away with the refillable mugs all together, or use a biometric system to regulate how many times they are refilled. I have also heard that they are considering putting some of these mugs in the parks. They were selling these same mugs in the Magic Kingdom on my last visit, however, when I questioned the cast member, she said that they were not to be refilled in the park. So, as I mentioned, these are rumors. I guess we will just have to wait and see.